दुक्ख (पाली) किंवा दुःख (संस्कृत) ही महत्त्वाची बौद्ध संकल्पना आहे. दु:खाचा सामान्य अर्थ वा कारणे "वेदना", "असमाधान", "असंतोषपणा" किंवा "ताण" होतो. हे मौलिक असंतोष (मूलभूत असमाधानकारकता) आणि सांसारिक जीवनाच्या वेदनेला (दर्दनाकता) संदर्भित करते. दु:ख हे चार आर्य सत्यातील पहिले आर्यसत्य आहे. हा शब्द मोक्षाच्या (आध्यात्मिक मुक्ती) चर्चेत उपनिषदेसारख्या हिंदू धर्मातील ग्रंथांत आढळतो. ^ Malcolm Huxter (2016). Healing the Heart and Mind with Mindfulness: Ancient Path, Present Moment. Routledge. पान क्रमांक 10. आय.एस.बी.एन. 978-1-317-50540-2. , Quote: " dukkha (unsatisfactoriness or suffering) (....) In the Introduction I wrote that dukkha is probably best understood as unsatisfactoriness." ^ Peter Harvey (2015). Steven M. Emmanuel, ed. A Companion to Buddhist Philosophy. John Wiley & Sons. pp. 26–31. आय.एस.बी.एन. 978-1-119-14466-3. ^ Carol Anderson (2013). Pain and Its Ending: The Four Noble Truths in the Theravada Buddhist Canon. Routledge. pp. 1, 22 with note 4. आय.एस.बी.एन. 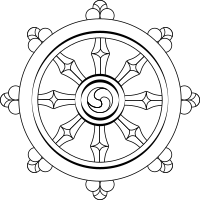 978-1-136-81332-0. , Quote: "(...) the three characteristics of samsara/sankhara (the realm of rebirth): anicca (impermance), dukkha (pain) and anatta (no-self)." ^ Paul Deussen (1980). Sixty Upaniṣads of the Veda, Vol. 1. Motilal Banarsidass (Reprinted). pp. 482–485, 497. आय.एस.बी.एन. 978-81-208-1468-4.